In this study, Eu3+-doped ZnO nanowires were prepared with different concentrations of Eu3+ ions by a hydrothermal method. Before the Eu3+-doped ZnO nanowires were grown, sputtering was used to deposit ZnO films of ~300 nm thickness on SiO2/Si and glass substrates as the seed layer. Zn(NO3)2-6H2O, Eu(NO3)3-6H2O, and C6H12N4 were used as reagents to grow the Eu3+-doped ZnO nanowires on ZnO/SiO2/Si and ZnO/glass substrates. 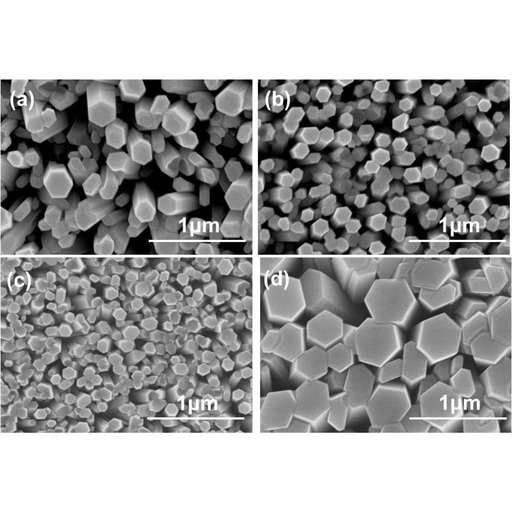 First, the Eu3+-doped ZnO nanostructures were grown on the substrates at 100 ℃. We found that the nanowires could be successfully grown because an undoped ZnO solution was used, and the Eu3+-doped ZnO nanowires could not be grown because different concentrations of Eu3+ ions were added. We also found that the required growth temperatures of the Eu3+-doped ZnO nanowires decreased with increasing concentration of Eu3+ ions. In this study, we also thoroughly investigated the effects of different concentrations of Eu3+ ions on the luminescence properties of the ZnO seed layer and the Eu3+-doped ZnO nanowires. We showed that the substrates used and the concentrations of Eu3+ ions have considerable effects on the photoluminescence properties of the Eu3+-doped ZnO nanowires. Wen-Jie Zheng, Wen-Cheng Tzou, Jei-Ru Shen, Cheng-Fu Yang, Chih-Cheng Chen, Effect of the Concentration of Eu3+ Ions on Crystalline and Optical Properties of ZnO Nanowires, Sens. Mater., Vol. 31, No. 2, 2019, p. 447-455.